Did you know that “Abracadabra” comes from the Aramaic…” abraq ad habra”, which literally translates to “I will create as I speak”? The message of The Unknown Mother is to reawaken people to this truth and to that which we habitually take for granted…the power of the voice. When we bring our awareness to our voice and learn to express it in new ways, with impeccability, we rediscover our true message. Voice is the key to unlocking our power and magnificence. This isn’t standard knowledge; this is a gift for our times taking the reader into the heart of sonic mysteries. 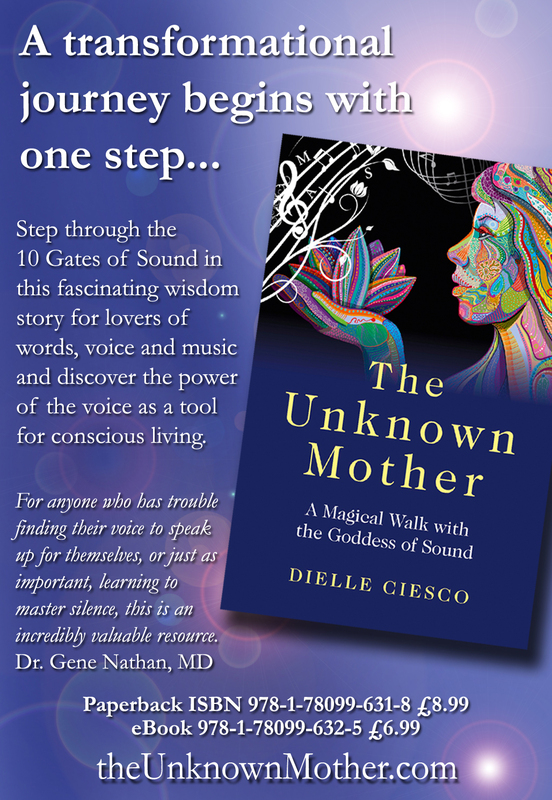 The Unknown Mother is an adventure merging the revelations of personal experiences along the Sacred Sound and Toltec paths as it reveals some of the principles behind these wisdom traditions. It is about allowing and accepting our magical selves. Please follow, like, and share The Unknown Mother on Facebook! This book is alive. It senses your presence. It is meant to be like an apprenticeship with a wise teacher…the teacher being you. There is power on every page should you choose to open to receive it. In fact, this book is reading you just as you are reading it. It’s in partnership with Life, and the three of you, whether you realize it or not, are colluding to give you exactly what you need. It will arrive, whether or not you follow through on the exercises. Your intent is enough to bring it to you. Will you be aware when it arrives or will the moment pass unrecognized? A treasure trove of poetic activations and sound wisdom based on The Unknown Mother: A Magical Walk with the Goddess of Sound, Your True Voice is a stand-alone or companion text offering detailed practices that encourage your enchanted journey through the 10 Gates of Sound…The Vocal Channel, Breath, Letters, Words, Storytelling, Listening, Vibration, Vocal Toning, True Voice, and Rainbow Light, and beyond. Included are quotes from the original text, explanations, anecdotes, and prompts, and the all new Transformational Voicework processes…all tools to help you recover your authenticity, creativity, and truth. Dielle has appeared as a guest on numerous radio and podcast shows. To listen, check out the archive. or check your favorite local bookstore. They need our support!